Ok ladies, here you go! Designed and built by women for discerning women anglers who want ultimate performance and versatility. The Simms Women's G3 Guide Stockingfoot Waders boast a 4 layer Gore-tex pro shell in the legs and seat and a 3 layer Gore-tex pro shell upper and are now improved with 190% more breahability. Designed and tested by women anglers for improved comfort, the Women's G3 guide waders will be the best waders you've ever worn. 4-Layer GORE-TEX® with 190% more breathability featured throughout the legs for increased durability. Women’s specific cut features scalloped top opening that fits higher at the chest and lower at back, patented front and back leg seams provide an articulated Women’s specific fit & provide all day comfort. REGULAR=Women 5'4" to 5'7" | SHORT=Women 5'1" to 5'3" | TALL=Women 5'7" to 5'9"
**Custom Shop Sizes: Small Short, Medium Tall and Large Tall are available for an additional cost. I have been looking for a more durable pair of waders that are thicker and have more room for the winter. These are definitely well made and tough but unfortunately the feet do not fit. I am 5'6", rather lean, with a shoe size 7/7.5. I ordered a small and there was plenty of room for extra layers. However, even without socks on the booties were tight. A medium would have been dangerously large if I went under while fishing. These Simms Women's G3 Guide Gore-Tex Fishing Waders are comfortable, durable, constructed perfect, look nice and really fun to fly-fish with and come highly recommended by me, so check out this Simms Women's G3 Guide Gore-Tex Fishing Wader. on 12/7/2017 The Simms Women's G3 Guide Gore-Tex Fishing Waders Price well worth it! Hey folks, just wanted to let you know that these women's Gore-Tex fishing waders are really great for us ladies. 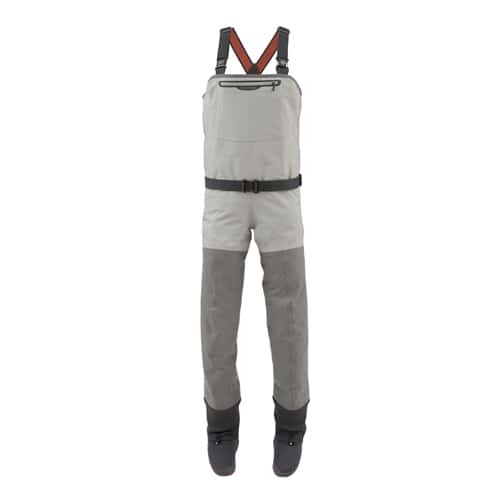 They fit real nice and are all-around great Simms Women's G3 Guide Gore-Tex Fishing Waders. The price was well worth it in my personal opinion because of the quality and craftsmanship, so check them out.